New York City Travel Survey | Resource Systems Group, Inc.
RSG is the lead consultant on a team selected by the Metropolitan Transportation Authority (MTA) to conduct a regional travel survey in New York City. 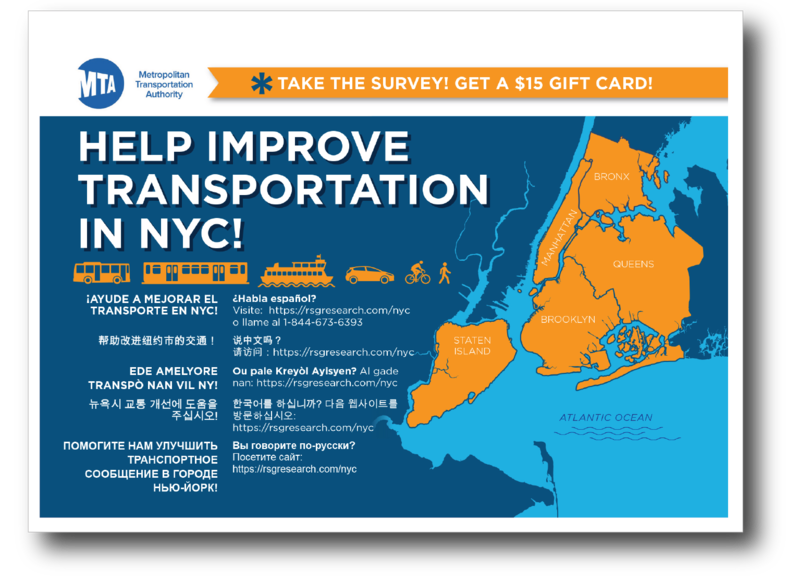 The survey will collect data on travel origins and destinations, trip purposes, and socioeconomic and travel characteristics of both New York City Transit customers and noncustomers residing in the five boroughs. The survey is being conducted to gather data that will assist in the recalibration of MTA’s Regional Transit Forecasting Model and to satisfy the Federal Transit Administration’s requirements for on-board transit surveys and fulfill Title VI requirements. As part of the project, RSG will be deploying its innovative smartphone-based GPS data collection app, rMove™, in concert with an address-based sampling and intercept recruitment approach to collect unlinked transit trip data as well as details on other modes used, including walking, biking, driving, taxi, and mobility service providers (e.g., Uber, Lyft). RSG will be cleaning and processing these data and performing weighting/expansion on the final dataset once the data collection period is complete.